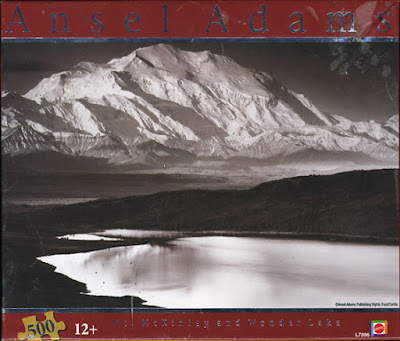 Today I will be reviewing Mattel's jigsaw puzzle L7896 which is Ansel Adam's photograph of Mt. McKinley and Wonder Lake. Completed Dimensions: 14" x 18"
Box Dimensions: 8" x 7" x 3"
The puzzle image is based off of a 1947 photograph captured by Ansel Adams. Multiple silver gelatin prints have been made from the original negative and it is not clear from which particular print this puzzle image has been based. Majestic Mt. McKinley occupies the greater portion of the upper half of the photograph, glowing pale in early morning light. It rests behind dark rolling hills that transition to the lower half of the image and encapsulate the serene waters of Wonder Lake. As characteristic of Adam's photographic work, it is a technically proficient execution with both a wide dynamic range--from the pure whites of the lake to the deep blacks of the tree covered hills--and also immense depth of field with the entire subject matter in focus. While Wonder Lake does not reflect the image of Mt. McKinley on its glossy surface, it reflects its mass in visual balance. There is a near perfect balance of space in each half of the photograph represented in its opposite half, as divided from center horizon. Left: Original image. Right: 180 degree rotation. Notice the near perfect balance in symmetry. Alaska's Mount McKinley is now and henceforth known as Mount Denali. This is a very recent change based on a decision by the current presidential administration. Denali is the original "Native American" name for the mountain and translates to "the tall one." It was named McKinley in 1917 by elderly white male politicians in honor of assassinated former president William McKinley. Many people are upset over the name change because change is difficult to handle. Ohioans feel it is an Ohio dishonor to their Ohio state pride in Ohio and Ohio native W. McKinley. Old male politicians are upset because it is an action taken by a president with whom they want to have something to be loud and upset about. Textbook and map publishers are very happy because they get to sell hella more product based on this change. To my knowledge, Wonder Lake is still Wonder Lake, but sometimes I wonder if it might change too. One Direction Wonder Bread. 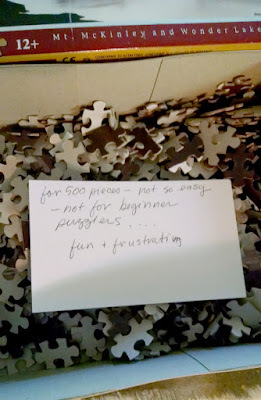 I usually buy most of my puzzles locally from the puzzlesmith downtown who uses only fresh organic local materials in her low-carbon-footprint zero waste puzzletorium. Sometimes if I'm supporting a local bookstore in person and a puzzle catches my eye I'll use my frequent puzzle e-card to make a paperless transaction in which I receive a puzzle and the merchant receives invisible points deducted from my imaginary account that accrues negative interest and requires a real payment of real promissory notes issued by the Federal Reserve. Or if I have to buy a puzzle on Amazon, I'll make sure to only get fair trade puzzles and also use Amazon Smile which will donate a tiny portion of my purchase to a charity of my choice which happens to be Doctors Without Borders. This particular puzzle came from the thrift store. An item with so many small pieces is a thrift-store gamble. But I (often mistakenly) have trust in other people and I trust this puzzle is wholly represented within the taped box. The cost was $.90 + 7% sales tax. That's a deal! I tried to find a retail price for comparison, but its Sears page hasn't been updated since 2011 and does not list a price. $8.39 on eBay, but eBay prices aren't real. Hindsight is something to look at in retrospect with two-eye vision or something. I should have made an unboxing video for youtube. I hear that kids love unboxing videos. Alas. The first thing I noticed when I opened the box was a notecard with a message--left, presumably, by the previous owner. A clue? A warning? My eyes were bursting at the seams, eager in anticipation, ready to devour the words, until finally the restraints snapped and my brain let all reading lose upon those morsels called letters comprising the words of the message. The notecard reads: "for 500 pieces -- not so easy -- not for beginner puzzlers.... fun + frustrating"
So it was an admonition after all. This was all so unexpected. I am not a beginner puzzler, certainly. I like having fun. I don't like being frustrated. Who wrote this? Why did they feel compelled to include this note? Should I even attempt this puzzle at all? Of course, duh. I do not have a dedicated puzzle table, but I do have a large smooth piece of wood (thatwhatshesaid) that I can place on a normal table--or, in this case, my coffee table--which provides an excellent surface on which to puzzle. The coffee table, however, proved to be a poor place to puzzle because it required much hunching and leaning and straining. A table height table is the best table height for a table. Something in the 27"-30" range (as measured from table top to floor) would probably be best. If I didn't know that already, maybe I was a beginner puzzler. But you know what? I didn't throw the puzzle out the window because I was having so much fun! The prophecy was true in every aspect. What does a person do after completing a puzzle? It is an exercise in futility. Build it, destroy it. A person might conceivably preserve the finished image to display on their wall in a frame. However, jigsaw puzzles are not necessarily the greatest display of skill to present to guests as a trophy. I mean, a 12 year old could do this. Likewise, it's not a particularly stellar reproduction of the original photograph. If a person wanted to display a puzzle image for its beauty, then I would suggest getting a poster of the original image. To create. To destroy. All at your own hands and of your own accord. That is the zen of a puzzle. Sort---Sift through the box piece by piece and take out all of the edges. Not worrying about placement or counting the individual pieces of a secondhand puzzle, the edges are all placed face up onto the puzzle table. Build a perimeter---Begin to assemble the edge pieces to form the perimeter. Corners are easiest. Next are "strings" of pieces that are easy to piece together based on puzzle image. Then form the strings into longer chains until the complete perimeter of the puzzle has been interconnected. 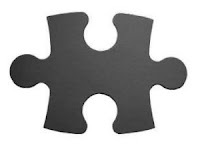 Get all of the pieces face-up on the table---This is not always possible depending on table and puzzle size. For this puzzle it was possible. I began grouping them in neat grids based on the image (black pieces, gray, white) but this quickly devolved into just getting them all out of the box. Fill in the middle---This can happen in chunks (and usually does) where certain areas can be made out and assembled in the general context of the puzzle. Then these islands can be attached together and to the border. This ends with filling in random holes until the puzzle is complete. Important note on assembling a puzzle---Whenever a piece is fit with another piece, the person to fit that piece must use their finger to thump loudly and repeatedly on that piece in order to draw attention to that fact that a piece has been fit even if there is no one else in the room or participating in the puzzle. So now lets talk about this damned puzzle. Firstly I am unsure if this secondhand puzzle is a complete puzzle. 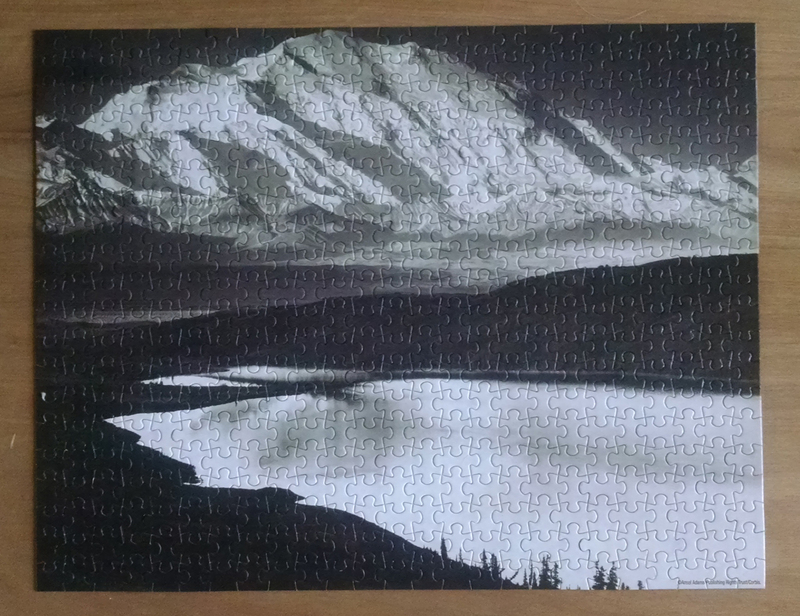 I did not count the pieces individually or by weight. Therefore, any gap in building the puzzle is potentially a missing piece. This plays heavily into frustration when no piece seems to fit in a certain place and I needed to repeat trying pieces or skip that area of the puzzle. If you scroll back up or have an eidetic memory then you will notice that on the box picture (from which I base my assembly process) there are no trees along the bottom portion of the lake, but in the actual puzzle there are trees. This adds to my uncertainty of what the box does or does not show. Guessing makes for slow work in a jigsaw puzzle. Misleading representation. To add to this frustration, neither the box nor the puzzle image are very well printed. Many areas where I feel there should be a distinct difference in value and texture actually are not that distinct. The smooth sky is black not dark gray and is indistinguishable from the trees in the mountains which also appear black even though they should be lighter with more detail in the terrain. I had to use a flashlight at times to try to see detail in the black pieces. Poorly produced. And so it could be placed 2-positions horizontally or 2-positions vertically, alternating like patchwork across the image with no variations which leads to the maximum amount of potential fitting combinations possible in a puzzle compared to those with varied piece shapes. Because look at the puzzle. The easiest part was the bottom right corner because it was the only white corner and also had words on it. The easiest border to build was the bottom border because it had trees and a black/white coast line on most of the pieces. Right side was the second easiest border because of striations in scenery. The top border went quickly but I just got lucky that pieces fit on the first try and were in the right place. Besides high-contrast coast lines and certain identifiable mountain shadows, this whole puzzle was basically guess work (using pieces that would fit in places they shouldn't!). And that made for a very frustrating puzzle. But it was also fun! Puzzles are fun! A challenge is fun! As a recovering photographer I was really looking forward to examining the fine detail--poring over every puzzle piece--in a great Ansel Adams photograph. I didn't really get to do that because of the poor production value, though, I still ended up with a pretty neat looking image in the end that I left intact for two days before destroying and putting back into the box that I will now probably burn so that this evil shall never befall another poor unsuspecting soul. Plus, the harder something is the greater the satisfaction at finishing. I found this review after doing a google search for Ansel Adams puzzle reviews. I am working on another puzzle in this series, Adams's 'Oak Tree in Snow Storm.' It's driving me completely bonkers for all the reasons you listed. I had about 30 pieces left when I discovered I needed to take out a 5x5 section of pieces after close examination revealed the section, although appearing to fit snugly in place, was shifted one row over. GAH! I'm determined to finish this thing, but it's nice to know I'm not the only one experiencing frustration.